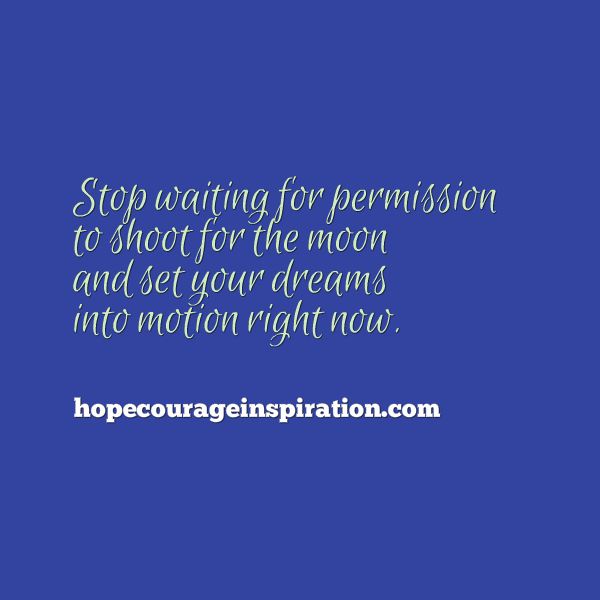 Stop waiting for permission to shoot for the moon and set your dreams into motion right now. After all, what are you waiting for? Your dreams are the most authentic reflection of your deepest self; they represent your purest purpose and are just waiting for you to bring them to daylight. But without action, dreams are only shadows, and without deliberate purpose and hard work, they too fade away. Discard excuses and consciously choose the direction of your dreams today. Set yourself on the path to your dreams and refuse to be pulled from them. Live purposefully, live powerfully and feel the great reward that engulfs your life when you reject the status quo and reach for the stars. Begin writing your unique story today. There is no limit to what you can accomplish when you set your dreams in motion.